This is part 2 in my series on SQL window functions. In this post, we will explore using ranking functions. SQL Server support four different ranking functions which are supported in SQL Server versions 2005 and forward. All of these functions require the use of the OVER clause. The following functions are classified as ranking functions: ROW_NUMBER, RANK, DENSE_RANK, NTILE. The ROW_NUMBER function will return a row number for each row within the partition based on the partition and order. This function requires the use of the ORDER BY clause. However, it is often used without the PARTITION BY clause as it will number the entire result set. If PARTITION BY is used, then the row numbering starts over within the partition. The following code shows how both of these work. While these are different functions with even different rules, it is easier to understand the difference when put side by side. 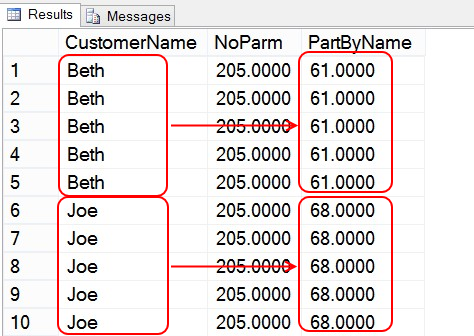 RANK and DENSE_RANK will order the rows based on the specified partition and apply a rank or number to them. Both RANK and DENSE_RANK will assign the same rank to “ties”. For example if rows 3 and 4 have the same value in the partition, they will have the same rank. The difference is how it handles the next rank number in the series. RANK does a “true” ordering and will apply the ranking based on the number of rows and skip numbers that are ties. So, if you have a tie between the third and fourth row and the first two rows and the final row are unique the ranking is as follows: 1, 2, 3, 3, 5. As you can see, 4 is missing. DENSE_RANK keeps the tie as well, however it does not skip any numbers in the sequence. Here is the same example set based on using DENSE_RANK: 1, 2, 3, 3, 4. As with the ROW_NUMBER function, the ORDER BY is required for these functions. The last of the ranking functions is NTILE. NTILE groups the data into ordered and ranked groups based on the ORDER BY clause. The number of groups used in the ranking are specified in the function itself. So if you specify four groups to produce a quartile ranking, four ranked values, one through four, will be assigned to each group based on the order. In many cases, the total numbers of rows is not divisible by the number of groups chosen. For instance, if the number of groups is 4 but the total number of rows is 39, then the first three groups will return 10 rows and the final group will only return 9 rows. The function will always frontload the results so the earliest groups will have the “extra” rows. If a PARTITION BY clause is used, the NTILE ranking will applied within each partition. As with the other ranking functions, the ORDER BY clause is required to use this function. Up next, using aggregate functions with window functions. 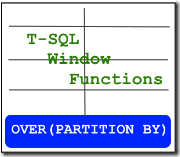 SQL Window functions were introduced in SQL Server 2005. At the time, only a small set of functionality was available. 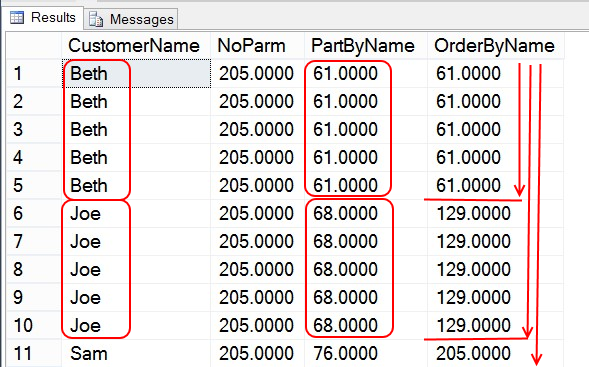 Window functions fill a need in the aggregation story for SQL Server. Window functions allow the developer to use row level aggregations without the penalty of using cursors to accomplish a similar task. Window functions allow you to segment a set of rows and then apply a function to that set of rows. In many cases, you may choose an aggregation function. However, other functions are also available including ranking and analytic functions. 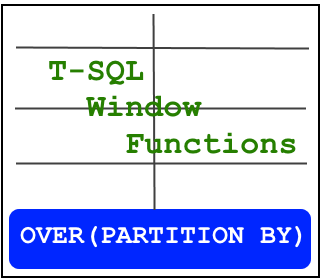 In this four-part series, I will start by breaking apart the OVER clause which is the key to understanding window functions in SQL Server. The following posts will expand on each group of window functions which use the OVER clause – ranking, aggregate, and analytic. Up until 2008 R2, SQL Server only supported a subset of window functions which focused on ranking and some aggregation functions. With SQL Server 2012, Microsoft greatly expanded its support for window functions in T-SQL thus making fairly complex operations such as running totals much simpler to accomplish. The purpose of the OVER clause is to define the window over which the function will be applied. The default functionality is to define the window for the entire table. As shown in the example below, the result is the same as if you had used an aggregation function without a GROUP BY clause. Some of what makes OVER unique includes the fact different windows can be specified in a single SELECT statement as will be shown in later sections. The OVER clause takes three additional arguments which change the scope of the clause — PARTITION BY, ORDER BY, and ROWS or RANGE. The PARTITION BY clause is used to reduce the scope of the window to which the aggregation applies. This clause partitions the default or entire result set into partitions based on the criteria specified. The function will be applied to each partition independently. At this point, we begin to see the real power of window functions. While similar to the GROUP BY clause, the PARTITION BY clause allows you to specify different partitions within the same select statement. The following example builds on the illustration above with no partition specified and a partition on the CustomerName field. The ORDER BY clause is used to order how the partitions apply the window function. For instance, when an ORDER BY is present in our current illustration, it will sum all of Beth’s order amounts, but will then add Joe’s to the total as he is the next in order. In the following illustration, no partition is specified so the partition is still the whole table. You can now see how partitions and ordering affect the window function. As you can see, if no partition is specified the order will apply to the entire result set or the default partition. This is particularly important to understand when using ranking functions with the OVER clause. Before SQL Server 2012, the ORDER BY clause could only be used with ranking functions. With the release of SQL Server 2012, the ORDER BY clause can now be used with ranking, aggregate, and analytic functions. The following image visually illustrates the how the PARTITION BY and ORDER BY clauses aggregate and rank data. The final clauses that can be used to define a partition are the ROWS and RANGE functions. 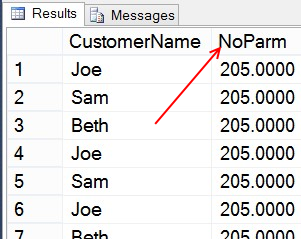 This functionality was introduced in SQL Server 2012. These functions will specify a set of rows based on the position of the current row and as a result both functions require the use of the ORDER BY clause. Because each partition is anchored to the current row, the rows or range specifications are based on their proximity to the current row. A number of key words can be used with this clause to define the window frame used by the window functions. • CURRENT ROW: That’s what it means. It identifies the current row as part of the ROWS or RANGE. This key word is supported by ROWS and RANGE. • UNBOUNDED PRECEDING: Go to the beginning of the partition. This is supported by both ROWS and RANGE. • UNBOUNDED FOLLOWING: Go to the end of the partition. This is supported by both ROWS and RANGE. • n PRECEDING: This is used to specify the number of rows before the current row. This is only supported by the ROWS clause. • n FOLLOWING: This is used to specify the number of rows after the current row. This is only supported by the ROWS clause. A couple of other notes regarding ROWS and RANGE. In cases where the partition returns no rows, the value returned is NULL by default as seen in rows 5 and 10 above. Also, if the partition only returns fewer rows than specified it will only apply to rows within the range. In the example above, row 4 NextTwoAmts column will only return the sum of row 5 as it is the only row included in the partition. Finally, ROWS and RANGE react differently when only the CURRENT ROW is specified. When CURRENT ROW is used by itself with the RANGE clause it will apply the function based on the partitioning and ordering. However, when used with the ROWS clause, it will only return the current row regardless of the partition specification. The next three related posts I will discuss ranking functions, aggregate functions and analytic functions.